TULSA, OK (KJRH) — In most Oklahoma school employee handbooks, you won't find guidelines for how much teachers should talk to students via social media and texting. But a new senate bill would require schools to include those guidelines. Larger Green Country school districts give teachers guidelines, but don't offer any hard rules. Senate Bill 45 is pushing to change that. 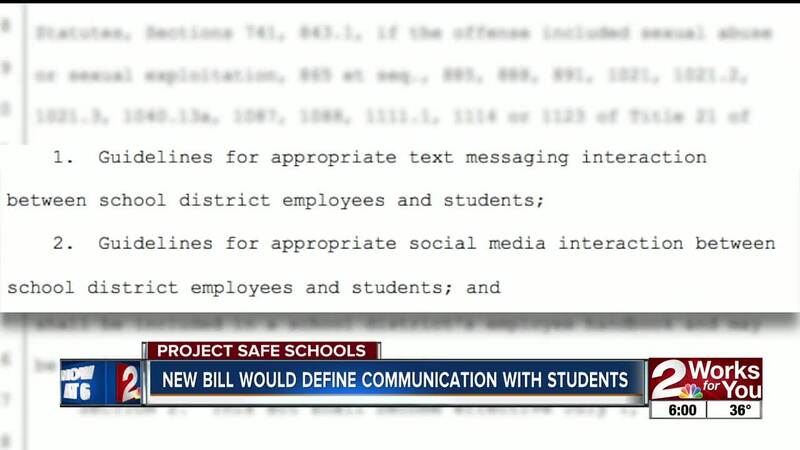 The bill would require each district set guidelines for appropriate text message and social media interaction between school district employees and students, and include them in handbooks. Tulsa Public School's handbook doesn't mention any official board policy, but teachers do have guidelines telling them what's appropriate. In 2013, Tulsa Classroom Teachers Association and TPS teamed up to create guidelines for teachers, including rules for electronic communication. "It needs to always be about business," said Linda Hendrix. She's the Oklahoma Education Association Advocacy Specialist assigned to TCTA. "We need to be very professional, and careful about our use of social media." A representative with TPS tells 2 Works for You they would be open and willing to any change that clarifies what's appropriate, and what keeps students and teachers safe. In Bixby, there is an explicit policy that "Employees should limit communication with students to matters concerning a student's education, or extracurricular activities for which the staff member has responsibility. Bixby Superintendent Rob Miller says he's "supportive of Senate Bill 45, and any effort to protect students and teachers from inappropriate use of social media."